The French leader said the eurozone has deepened disparities, loading indebted nations with yet more debt and making competitive countries even more competitive. France's public debt stands at more than 96% of economic output, compared with 68.3% in Germany at the end of last year. Unemployment is above 9% in France but closer to 4% in Germany. Mr. Macron is calling for a shared eurozone budget that could be used to for a variety of reasons, including helping currency members in economic distress, believing that would help address flaws revealed by the 2010 debt crisis. For the eurozone to have a future, the French leader said, it must have "powerful solidarity mechanisms." The French leader said Germany should assist with a stimulus of public and private investment in Europe and work with France to find "the right macroeconomic plan." Here is where the extortion comes in: "Germany has benefited from these malfunctions of the eurozone. This situation is not healthy because it is not sustainable," Mr. Macron said. Socialists love to frighten voters into thinking that inequality is on the verge of launching another French revolution. However, readers should keep in mind that the only rioting taking place has been in Greece and Venezuela, nations that have gone the farthest in implementing Macron's "powerful solidarity mechanisms." President Macron is obviously confused, but that is the permanent state of politicians. He can’t decide if Germany is just lucky or actually implemented wise policies that led to her success. The socialist in him wants Germany’s success to be the result of the creation of the Big EZ and luck. The state and luck are the twin gods of the left. Then he could justify his demands that German’s don’t deserve their success and so should fork over most of it to the losers who didn’t deserve to lose. 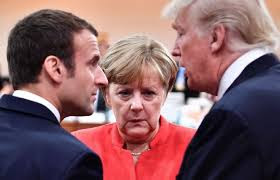 But President Macron’s common sense tells him that Germany actually did something right and that France and the Big EZ's southern conference need to do more to spur growth in their economies by reducing taxes and labor regulations. I don’t know how to help Mr. Macron, but then I think all politicians are beyond help. I realize it’s futile, but I would suggest Mr. Macron read the works of Wilhelm Roepke, the architect of the German “miracle” economy after World War II. He would then have a better idea of the causes of Germany’s continuing successes. Mostly he should read the works of a great Frenchman, Frederick Bastiat. Bastiat wrote for the average French reader in the middle of the 19th century, so Mr. Macron will find it challenging, but I think if he works hard, even a politician can grasp the essentials of what Bastiat has to say. As for the divergence between the economies of the EZ North and South conferences, the causes are simple. The more socialist countries of the south thought that a single currency would save them from the embarrassment of having to continually devalue their currencies. They didn't see the cause of their problems in their socialist policies. Instead, they blamed their failing economies on too much capitalism, just as the Germans did before World War I, according to Mises. Socialist policies had destroyed their economies, much as they had done in Greece, Argentina and Venezuela, and tax revenue plummeted. They had to borrow enormous amounts from the Northern Big EZ in order to keep paying for their socialism. Eventually, they couldn't pay the interest on the debt and the Northern conference grew tired of tossing their wealth into the money pit. Donald Trump is not the greatest threat to the Big EZ. Socialism is. The slightly less socialist nations of the north will someday grow tired of bailing out the south and sue for a divorce.